Minimum quantity for "Oxford Aquatex CV202 MEDIUM Waterproof Motorcycle Cover Black and Silver" is 1. 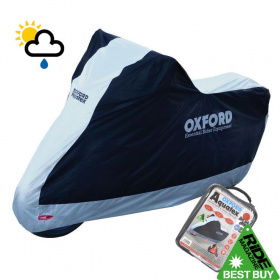 Oxford Aquatex CV202 Medium Waterproof Motorbike Black & Silver Cover The cover provides protection from rain, snow, frost, sun, dust, dirt, tree sap, bird droppings and other pollutants. This is an essential product for all motorcycle owners to have as it protects your bike from all weather damage which will prolong the life and value of your motorcycle. Size – 229cm Length – 99cm Front width – 125cm Front height Please check the size of your motorcycle against the dimensions given as some models may vary. This is a universal aftermarket cover & will fit up to a 750cc engine.